Your wedding dress, veil, and keepsakes create cherished memories and preserving those pieces for future generations can be done with just a bit of care. The key to preserving a wedding gown or any type of fabric is to protect it from the elements, especially light and moisture. With proper handling, the gown and accessories should last for hundreds of years. Planning for the future preservation of your wedding dress begins on the day you start shopping. When you find "the dress" be sure to ask the sales consultant how the dress should be cleaned. Look for special instructions on how to clean any delicate trim, beads, or sequins. In the United States, the Federal Trade Commission requires that each gown have a care label that you should take time to read. Every wedding gown should be cleaned before being stored away for more than a few weeks even if it doesn't look soiled. Perspiration, food and drink stains, and makeup stains can show up later and become much more difficult to remove. Look for a professional dry cleaner that specializes in wedding gown preservation. Be sure to point out any stains and any loose trim or buttons. Also discuss, if you know, how the trim is attached to the gown. Some designers use an adhesive that could dissolve during the dry cleaning process. 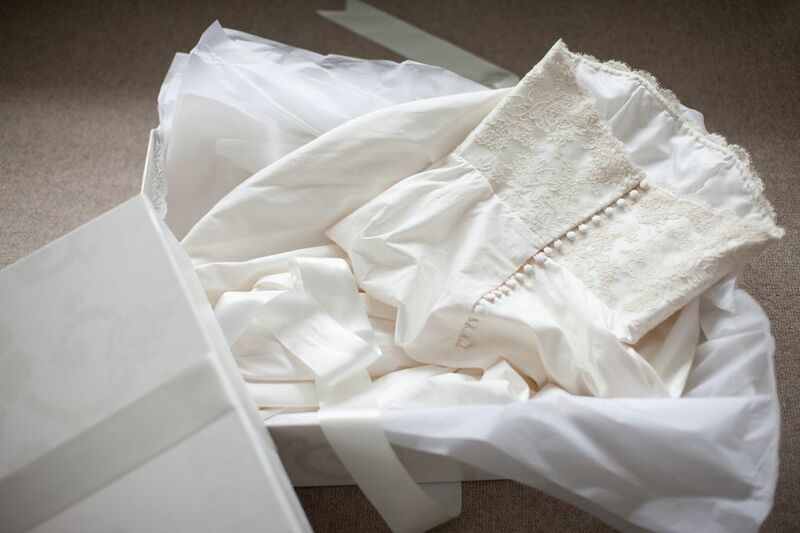 If the cleaner is going to pack your dress for storage, ask your cleaner to allow you to inspect your gown before it is packed in an acid-free box to help prevent contamination. This will prevent surprises when you open your sealed box years from now. There are horror stories of missing gowns and veils or the wrong dress packed away. If your gown is simple and made from fabric that can be hand-washed at home, pretreat the stains and be sure to check the dress well for damage before you store it away. One important tip is to allow the gown to dry completely before packing away to prevent mildew growth. Keep the gown away from both artificial light and natural sunlight to prevent fabric damage. If you plan to do your own packing of the dress and accessories for storage, be sure every piece is clean and completely dry before storing. Accessories like a belt or headband that have metal buttons or faux jewels and decorations should be stored separately from the fabric items to prevent accidental damage from tarnishing. The same goes for leather goods such as shoes or handbags. If possible, wedding dresses should be stored flat in an appropriately-sized container. Garments that are left hanging can become misshapen and develop rips and tears from the stress on seams. Never use a regular cardboard box unless it is a storage box labeled for archival storage. These are made of acid-free paper and are perfectly safe to use. Buy the largest size needed because the fewer folds in the dress, the less chance there will be fiber breakage from creases. However, if you cannot find archival storage boxes or if you are concerned about the box getting crushed, purchase a plastic storage box. The box must be made of cast polypropylene to be safe for your fabric keepsakes. Look for the #5 within the recycling triangle or the letters "PP" to be sure that you have the correct type of box. Other types of plastic can cause yellowing. Never store a wedding dress in the plastic bag furnished by a dry cleaner. If you plan to leave the dress hanging, cover it with a white, 100 percent cotton garment bag or make one from a white cotton bed sheet. You will also need to purchase archival tissue paper. It must be labeled as both acid and lignin-free. Lignin is a chemical compound derived from wood and will cause fabrics to yellow. You will need the tissue to soften folds, wrap individual pieces, and stuff sleeves and headpieces so they will not be crushed. Before you begin, wash and dry your hands. No lotion or creams should be used that can stain the pieces. For best results, simply wear clean white cotton gloves. Begin by lightly stuffing the dress shoulders and bust with the acid-free tissue paper to help them hold their shape. Then, lay the gown onto a layer of tissue within the box or container. Be sure that there is plenty of tissue cushioning each fold to prevent heavy creasing. The job will be easier if you have a helper who can hold the dress while you cushion each fold. Repeat steps with each individual accessory including the veil. Do not overstuff the storage box. You will want to store heavier items like belts and shoes in smaller individual boxes. Inspect your wedding treasures at least once per year. Look for any stains that may appear and treat them promptly. You'll have better success with stain removal the sooner the stains are caught. After inspecting, with clean hands, fold the items slightly differently and cushion with the tissue to minimize creases and stress to the fabrics.